*Note: Lunch will be an OKMC Youth Fundraiser. All OKMC Jr. High and Sr. High Youth are invited to come and prepare the food for lunch as well as assist in the cleanup for the meal. Youth will need to arrive prior to 9:00am and will work until the end of the day. 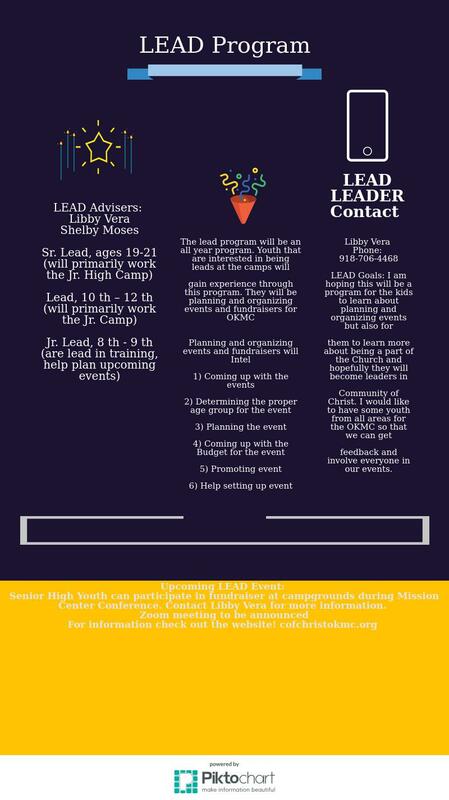 All interested youth will be participating in the business meeting, discussing involvement with the LEAD program, and are welcome to stay the night at the campgrounds on Saturday November 18th to Sunday November 19th under adult supervision. Questions? See infographic for more details or contact Libby Vera at 918-706-4468, Shelby Moses at shelbybuntin@gmail.com, or e-mail us at okmissioncenter@gmail.com.